Steeped in luxurious elegance and charm, this intimate, all-inclusive, adult-only resort is situated on the blissful island of Key Largo. Offering a glamorous yet serene escape, we think that Bungalows Key Largo is a wonderful choice for romantic getaways and spectacular honeymoons. There’s a total of 135 gorgeous bungalows, some situated along the waterfront, and others nestled into the tranquil tropical gardens. Each bungalow is incredibly spacious, offering between 84 and 102sqm of private living space, featuring a secluded oceanfront or garden veranda with a deep soaking tub, in addition to a luxury spa-style bathroom, a 60-inch smart TV and plush bathrobes. We love that each bungalow also comes with two bicycles, so you can enjoy time exploring this beautiful archipelago with ease. There are three lovely restaurants dotted around this stunning island oasis, each of which serves a divine selection of freshly-caught seafood and local specialities, complemented by a blend of international flavours; the property also features two ambient bars. There’s certainly not a shortage of wellness facilities at the resort either, with a heavenly Zen Garden Spa, two beautiful pools, a sauna, steam room and fitness centre, as well as daily sunrise yoga sessions. You’ll also enjoy a fantastic selection of non-motorised watersports, including stand-up paddleboarding, snorkelling and kayaking, and couples will love the complimentary Sunset Cruise (for those staying five nights or more). 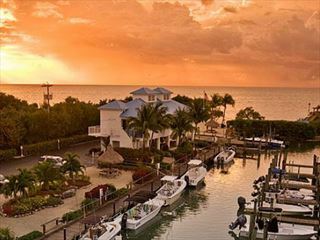 This resort is located on the island of Key Largo, in the upper Florida Keys. Snorkelling opportunities are abundant in this region, and the popular John Pennekamp Coral Reef State Park is just six minutes away from the hotel. There are lots of activities to enjoy on Key Largo, but if you’re looking to explore more of the Keys, Key West, the very furthest island, is around two hours away, and there are so many spectacular sights to encounter in-between. The world-famous Everglades National Park is also located just 46 minutes away from the hotel. Miami International Airport is around an hour’s drive from Bungalows Key Largo. Appointed with luxurious amenities and a contemporary coastal design, these sublime waterfront sanctuaries feature 84sqm of serene living space with utterly incredible views across the glistening ocean horizon. Natural textures and a cosy ambience fill these bungalows with an inviting sense of romance, whilst a deep soaking tub is the perfect spot to delight in a sundowner cocktail and magnificent views across the gorgeous Key Largo. Nestled within the fragrant blossoms and emerald flora of the lavish botanical gardens, these 102sqm bungalows offer an idyllic, serene hideaway. Unwind with the soothing sounds of nature in your elegant garden sanctuary, beautifully-decorated with calming whites and textured neutrals, further appointed with sumptuous amenities and plush décor. Accommodates up to four guests. Shaded under majestic palms, Sea Senor Restaurant is set beside the picturesque beachfront and glittering ocean, serving a delectable blend of fresh, local seafood and vibrant Mexican flavours. The local flavours of the Florida Keys are highlighted in every dish served at Fish Tales, a breezy seaside eatery set overlooking the ocean and infinity pool. Relaxed and casual, this restaurant offers all-day dining, so you can enjoy a plentiful breakfast buffet in the morning, grilled seafood, veggies and other local favourites for lunch, or specialty succulent steaks and freshly-caught seafood for dinner. The hotel’s sumptuous, incredibly romantic fine-dining restaurant, serving a wonderful six-course meal with expert wine pairings, featuring seasonal menus inspired by the day’s seafood delivery and the chef’s innovation. Every day is a new gastronomic adventure at Bogie & Bacall’s. Known as Largo Larry’s, the resort’s colourful Conch Cruiser serves a mouth-watering selection of on-the-go favourites, from chicken wings, burgers and sandwiches, to tropical fruit smoothies and breakfast burritos. Delight in refreshing beverages, icy local brews and thirst-quenching cocktails at the Sunset Tiki Bar, set beside the gorgeous infinity-edge pool. You won’t have to move a muscle if you’re craving a bite to eat or a cooling drink around the pool, with a wonderful choice of fresh salads, ceviches and seafood being served, alongside ice-cold drinks, homemade Key Lime Pie and other delicious treats.